Kelsey Fireheart posted about a new card called the Admiral Bundle today! This card is in Walmart stores! It has items Marleybone Warship, Bulldog Companion, Naval Outfit, Military Sabre, Crow's Nest Housing Add-On and a 1 Month Membership or Crowns! If you look closely at the card you can see you all of the items included. This gets me thinking about new Pirate101 cards later in other locations such as Toys-R-Us, Dollar General, etc. What more will they release?! I love all of the prepaid bundles/ cards. My favorite is this one right here, the Bulldog Companion reminds me of the Privateer teacher, not the same type of dog, but he just has that look! :) Can't wait to see this bundle in game! What's your favorite bundle/ prepaid card? Comment below! Edward makes it to Mooshu! Pirate101 Launches to the Public today! 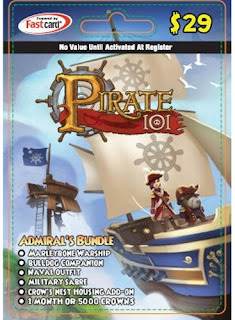 Pirate101 Prepaid Cards + Online Membership! Beta Gift - Pioneer Eye Patch! Halloween + New Design next Month!